Ephemeral materials – resurrected from the garbage – scavenged, collected and assembled – lie mostly concealed under the works of NKO. A collection of hundreds of works ranging from a few inches square to wall sized canvases are hung salon-style in the artist's otherwise austere, scrubbed apartment. The show represents a year's worth of work – of remembering and forgetting – of walking a little too far into impermanence and finding the way back. This body of work is an elegantly cohesive whole. Every piece is made up of the distinctive loops and lines of the artist's handwriting. Multiple lines of writing overlap into an indecipherable lacework of pattern, but sometimes there is a single, lingering word – as though the artist's mind suddenly slipped into a temporary quiet. There is a certain urgency and determination enfolded into these works. Just over a year ago NKO suffered a brain injury in a bike accident. While past work , as explained by the artist, was about forgetting, this work is more about remembering and exploring what endures, if only a little longer, than the present. The artist deliberately records this stream of consciousness on impermanent materials, cardboard and reclaimed papers, the decay of which is the true support of these works made up of layers of calligraphy obscured by paint, written over with another rush of words, then in a thoroughly unexpected move – gilded. Rough patches of gold leaf or words written in gold transform the works from simple recordings of a man's progress from injury to recovery into sacred icons of the transitory nature of life. How does one choose a group of works of art to write about? Should they have the same subject? Should they be created from the same material? What attracts the viewer to look more closely? What allows a viewer to really see a work of art? In researching the work I decided to write about, I came across the above quote elegantly stating the awareness I felt while getting to know the chosen works. Early on in a quick perusal of the Seattle Asian Art Museum to get my bearings and decide what artwork to write about, my eye fell on what appeared to be little chunk of a tree branch, about six inches long, sitting in an expanse of white display cabinet. It seemed out of place, almost accidental, as though the gardener absent-mindedly left it there after pruning the trees in the museum garden. Investigating, I discovered that it was actually a functional ceramic piece, made in the late 17-18th century CE of red-brown stoneware, in the form of a plum tree branch. Entitled Yixing Ware Water Coupe, it served as a combination brush holder and water dropper for the desk of one of the literate elite, often referred to as the "literati." Many elegant objects were created for the scholar's study in varied forms of plants and animals. A favorite was the prunus, or plum tree, which symbolized purity and together with pine and bamboo, is one of the "Three Friends of Winter" that represent the rewards of a long, fruitful life because they all live through and flourish in the harsh winter. Formally, this piece is a delight to study. Its playful trickery of the eye and of the mind causes one to ponder the quote above, asking what is object and what is subject and realizing that truth lies in the nothingness of the human response to nature, and to it. The artist deftly forms the dark red-brown clay to represent very naturalistically, a cutting of a gnarled tree branch. On one side is a wider fragment of branch that forms a small bowl, about the size of a cupped hand. The rim of the bowl is varied in contour and imitates an old branch hollowed out by decay. Out from under the bowl curves a smaller branch that twists and divides into a yet smaller branch, both having been "pruned". The larger of these extends diagonally to end above the top edge of the bowl and forms a spout from which water is dripped. The entire piece rests on three points formed by other "pruned branches." On the spout branch are smaller twigs that start out naturalistically, twisting back and lying along the surface of the branch, then subtly becoming more stylized into simple raised relief lines and geometric, symbolic plumb blossoms and buds. The literati artist who created this piece was adept at shifting from naturalistic all the way to symbol within one piece, keeping it harmonious enough to be pleasantly beautiful, and discordant enough to engage curiosity. Works of this nature were highly regarded by the literati, I could see why. This cunning little branch - that isn't a branch - laughed at me and challenged me saying, "I dare you to find my equal!" So the quest was on! Room after room was full of serene and beautiful images of nature, or more accurately, images of the human response to nature, and depictions of religious subject matter. Then across the depth of two rooms I glimpsed my branch's rival, or perhaps offspring, a blocky suggestion of a human figure chopped out of a block of wood about two cubic feet in size. Initially I saw little in common with the little branch (that isn't a branch), except it emanated a similar warm glow of rich, dark wood-brown. As I stepped closer it began to whisper to me, surprising behavior for such a roughly hewn form. It spoke of delicate balance, movement and contrapposto strangely similar to the little branch. It also spoke of tradition and modernity. Its creator, a contemporary sculptor named Ju Ming from Taiwan, carved it in the 1990's as one of many in a series called Taichi, also the title of this piece, which refers to a traditional form of martial art. Ju Ming was born in 1938. At age 15, he began an apprenticeship under a sculptor to learn traditional carving and painting techniques. By the age of thirty, Ju Ming, successful in his craft, turned to the art of carving and became the student of a prominent artist. His value of the spiritual informed his art from then on. His first solo show in 1976 was a success that garnered him a position in the art world. Ju Ming's imagery is described as Nativist and he became the symbol of the Taiwan Nativist Movement in the 1970's which developed in response to increasing Western influences in Taiwan. Though he found success in this body of work, consisting of heroes and country folk, he pushed forward and found his personal style through the Taichi Series. There are no available images of the work entitled Taichi on display at the Seattle Art Museum so I have included images of other pieces in the series that are similar in form, though different in size and material. I found contradiction in the form of Taichi. The human figure is seemingly hacked out of a large block of wood; every segment of the body is a cube-ish mass that could easily be separate pieces attached to one another. The linear marks of the carving knife, opposing each other from chunk to chunk, add to the effect. Yet it is a whole, not only carved from one piece of wood but the energy, or the spirit, or the life-force so obvious in it, inhabits the entire form. The sculpture captures the gesture of human movement through a spiraling latticework of diagonals. The supporting leg leans gently outward to the hip opposing the angle of the hipline, which in turn opposes the angle of the torso, at the top of which is a more dynamic diagonal of the extended arms, again opposing the previous line and all striking an active balance. Looking from above, the outstretched arms reach slightly forward creating a shallow "v" shape which is echoed in the highly simplified face that is created by regularly carved, downward sloping lines meeting at the corner of the block that represents the head. The figure's right knee is raised, again in a series of diagonals that carry the movement across, in front of the torso creating a twist. This contrapposto, combined with the surprisingly gentle curve that starts at the hipline and swings up over the figure's right hip then over the thigh and the amazing "s" curve that travels from the top of one arm, across the torso to the bottom of the other arm frees the sculpture from a clunky stasis. Instead, the form conveys the feeling of a brief pause in a fluid, dance-like motion. Ju Ming's skillful ability to compliment flow with naturally stationary forms leads me, as the little branch did, to contemplate the above quote again. Flow is the subject for the clunky wood. Clunky wood is the object for the flow. But flow and clunky wood relate to one another through the emptiness, or perhaps, openness of the viewer. Well this Taichi figure looked at me, or through me, with that typical martial arts gaze and offered its own challenge, "Find one more." I had one more piece to find, something that tied in with the commonalities of warm, brown color and wood as subject or material and something that could stand beside the other two works in engage-ability. As I circled around into another room I saw in the corner of my eye another human form, about eight inches high, carved of wood and finished with a similar warm sheen as the other two. It was created in 17th century CE China. Entitled Damo, it was a carving of Da Mo or Bodhidharma, a monk who became the First Patriarch of the Chinese School of Zen. Bodhidharma, or Da Mo, as legend has it, came from India, arriving in China in the year 527. After his message fell on deaf ears, he entered a cave at a Shao-lin temple and began a meditation known as "wall-gazing." He stayed there nine years before the first student arrived. Compared to the little branch and Taichi, this sculpture is much more narrative. It is a carving of a well-known figure in Chinese tradition and as such it requires certain visual cues that identify it as Da Mo. Most depictions of Da Mo show a roundish, petulant, scruffily-bearded man wrapped in a robe or blanket, peering out at the viewer with wide, sometimes fierce eyes. This carving, however, diverges from that convention and shows Da Mo in serene meditation. In fact, the only thing that strongly links this sculpture with the legend is its base, which is in the form of a miniature cave. The figure is emaciated, every stylized bone and joint shows through the paper-thin skin and he seems to have too many ribs. The carving is linear and geometric because of the skeletal dominance of the form. He sits erect, one leg crossed under, the other knee is up with crossed wrists resting on it, all creating a framework of open triangles. The carving is full of delicate detail. The carefully carved fingers that rest on the leg end in long, neat nails. The only just perceptible beard and mustache is neatly stylized and the hair is rendered in minute detail as small, spiraling tufts that cover the entire head. The minimal draping of the figure enhances the effect of frailty and the vulnerability of the physical body. The face is gaunt and the wear of years is evident, yet the serenely closed eyes, upward turned mouth and upward arching brows evoke timelessness and an unending life-force. 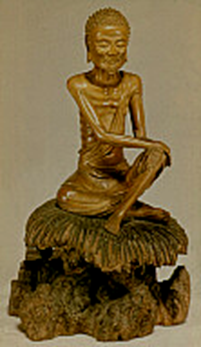 Contrasting with the smoothly polished figure is the base which is rendered so differently from the figure it appears as a separate piece of wood but it is not. It represents the natural world of plant forms and rock and is darker and rougher than the figure. The "nest" of grasses that Da Mo sits on is rendered as long, thin leaves that radiate out from under him. The figure and his cushion of grasses are raised up and supported by a cleverly arranged group of stalactites and stalagmites that form a miniature cave system, open on all sides, which links the sculpture with the tradition of Da Mo. I chose the works to write about based on an initial attraction I felt for objects within the framework of given criteria. I watched my eye peruse the collection with the expectancy of searching for a loved one in a crowd and felt my heart flutter when I located the object of my search. Looking at art requires conscious engagement with the work, it also requires an openness look past the obvious. Chinese Symbols and Motifs. 13 November 2009 <http://www.chineseart.com/chinese-symbols-tree.htm>. Hearn, Maxwell K. The Grandeur of Art During the Quing. 13 November 2009 <http://www.learn.columbia.edu/nanxuntu/html/art/>. Juming Museum - An Artist. 12 November 2009 <http://www.juming.org.tw/opencms/juming_en/about/founder/lifed/lifed_0002.html?tools=lifed&ina=2&seq=3>. Lai, Ming-yan. Nativism and Modernity: Cultural Contestations in China and Taiwan under Global Capitalism. 13 November 2009 <http://www.taiwanembassy.org/US/NYC/ct.asp?mp=62&CtNode=3642&xItem=57825>. Seattle Asian Art Museum. "Display Information." Suk-yee, Lai. Themes and Variations : The Zisha Pottery of Chen Mingyuan. Hongkong: The Shanghai Museum, 1997. Wu, John C. H. The Golden Age of Zen: Zen Masters of the T'ang Dynasty. Bloomington: World Wisdom, Inc., 2003.